Taste test: These are good chips, with a nice, mild sour cream and onion flavor. 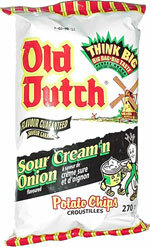 There seems to be more onion than sour cream in the taste. Several people kept coming back to the chip bowl for more. As the bag says, there were lots of chips in the bag. Smell test: Oniony and slightly creamy. Nice.